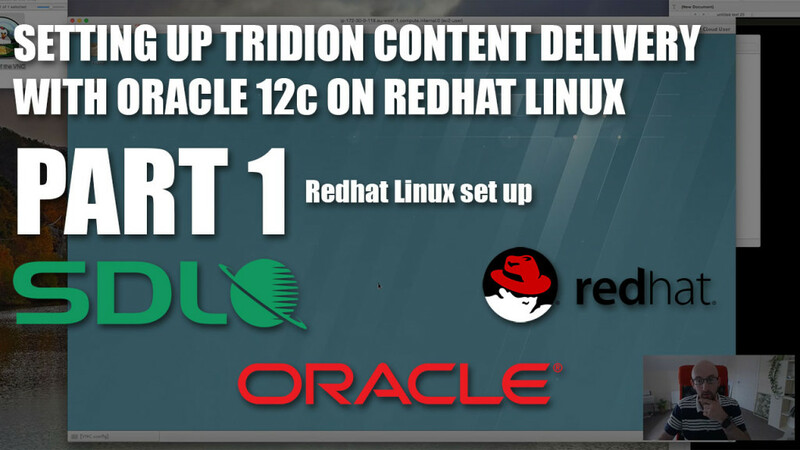 This is the first in a three part series on setting up Tridion Content Delivery on Redhat Linux with an Oracle 12c database. Read part two of the guide that steps through the Oracle Database installation and part three that deals with the Tridion Content Delivery database installation. SDL’s Tridion documentation does not go very deep into the set up of Content Delivery in a Linux environment and I have found little content out in the community around this. I thought that it would be valuable to create a few videos that step through the installation of a Redhat Linux server with Oracle 12c for Content Delivery for those with little Linux and Oracle experience. This isn’t intended as a set up guide for a production server (That’s what sysadmins and DBAs live for) but it will give you your own instance of a working Linux/Oracle CD environment that you can play around with. Notes, commands and links mentioned in the video can be found further down the page beneath the video player. Now go to part two of the guide that steps through the Oracle Database installation. This entry was posted in Content Delivery, Infrastructure by Mark Williams. Bookmark the permalink.